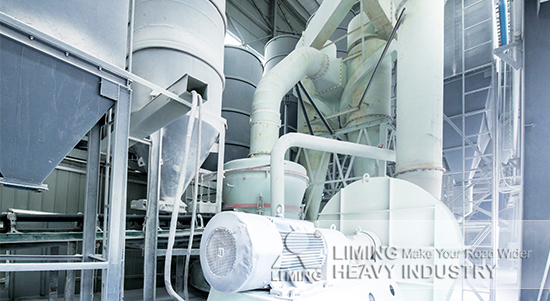 Aiming at many characters of gypsum, Liming Heavy Industry developed a set of process to produce gypsum powder efficiently. This production line grinds gypsum by dry process, and it can mill materials by itself. By using the variable frequency separator, the final gypsum powder can satisfy the standard of GB/T9776—2008, and it needn’t be screened and classified. Because of internal circulation wind, gypsum powder meeting demand can be blew out in case the materials are ground excessively. And advanced dust wiper makes system satisfied the requirements of environmental protection. Just because of these quality auxiliary machines, the efficiency is improved and capacity is increased. At first, crusher doesn’t crush big gypsum until its size is less than 30mm. Then gypsum is sent to grinding chamber for milling, and classifier will send gypsum powder satisfied with the requirements of required fineness to furnace in fluid bed, but the other should be sent to grinding mill for reprocessing. Qualified gypsum after burned will be sent to clinker silo for storage or finishing room for using.